It was a very bloody war. Today, most historians simply call it “the Civil War,” but it was anything but. From 1861 to 1865, nearly 3 million Americans fought in it, and more than 750,000 died as a result of the fighting, though most (two-thirds) succumbed to disease rather than violence. Those who died amounted to 2.5 percent of the U.S. population at that time. Were we to experience that casualty rate today, 7 million people would die. Though Kings Kamehameha IV and Kamehameha V kept the Hawaiian Kingdom neutral during the war, people from Hawaii still fought and even died in it. Records on most Hawaiians who joined up (or were pressed into service, often against their will) are spotty at best, but some details are known. Samuel Chapman Armstrong, born in Wailuku to a missionary couple, volunteered and eventually rose to the rank of brigadier general. Henry Ho‘olulu Pitman wasn’t so fortunate. Born in Hilo, Pitman also volunteered, but was captured fairly on in the war and sent to POW Camp Libby in Richmond, Virginia. Though freed as part of a prisoner exchange, his health had deteriorated so rapidly in prison that he died in February 1863. 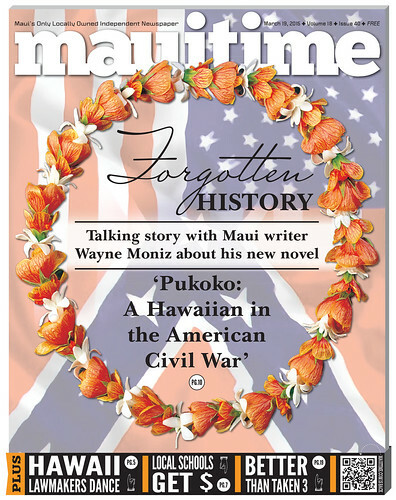 For local author and playwright Wayne Moniz, learning of such men spurred him to write his first novel, published by his own Punawai Press in October 2014. Titled Pukoko: A Hawaiian in the American Civil War, the book tells the story of Mo‘ikeha, a young sailor from Maui who gets caught up in the war. Though a work of fiction, Moniz says he based the story’s hero on men like Armstrong, Pitman and others he discovered through extensive historical research. MAUITIME: You’ve written 14 plays and who knows how many poems. Why write this novel? WAYNE MONIZ: Curiosity is what drove me. I’m not a historian at all, just someone who’s curious. I had the presumption that this made sense–Hawaiians traveled on ships, were great watermen. At least they would travel to the West Coast. When I found out that San Francisco was the training ground, that made even more sense. I didn’t know that the Union was training the Navy in California–that was also new to me. Right now Nanette Napoleon on Oahu is writing about Hawaiians in the American Civil War, but it’s a non-fiction thing. MT: In the book you thank Hawaii Pacific University Professor Justin Vance for being your primary historical source. Who is he? WM: He’s the head of the Civil War Roundtable of Honolulu. He and Anita Manning, the Waikiki Elks Club historian, wrote a piece on Hawaii in the American Civil War. They give some specific names, but it’s more of an overview of what happened–like the transition from whaling to sugar in Hawaii, which was a result of the blockade of the South. The blockade meant that the Union had to find some other market for sugar. And more than half the whaling fleet had been attacked by the C.S.S. Shenandoah. When Arnie Kotler invited me to the ceremony at the Punchbowl, I met the family of Henry Pitman. And Justin was there. Funny: I got a little late to the ceremony, so I started running up the hill. But when I looked back I saw two guys in uniform with guns running after me. They were reenactors who were late, too. Their uniforms were made of wool. Not sure how comfortable they would be in the South in the summer, but they said that when you sweat it acts as insulation. Not sure how true that is. MT: Were you ever in the military? WM: I was in ROTC, but never went into the military. My father was in Guadalcanal. I think of myself as a peaceful person, but wouldn’t deny anybody who wanted to do that. MT: Why write this book as a novel? Why not just do a non-fiction book about those who served? WM: If I did it as a non-fiction piece, it would only have been 10 pages. We have just a framework of [the Maui veterans’] life. They didn’t keep good records. But when I talk about writing fiction, I’m talking about adding dialogue. And even that was dependent on the context of the times. When I wrote about Kamehameha the Great, I wasn’t a warrior but I knew he had insecurities. It’s a way to humanize them in my books. But I still wanted to write about Pitman because his story was fascinating. I was sitting by the grave of Kino‘ole-o-Liliha [his mother] at Waiola Church in Lahaina when it came to me–just write it as fiction. Henry Pitman was 20 when he died. More died of disease than bullet wounds. Yesterday I ran across something a fellow soldier wrote about him. He was feeling tired as they were marching into Fredericksburg, and he hung back. That’s when they were captured and sent to Libby. Once you get the basic outline of the story, it kind of leads you on. MT: Speaking of the story, maybe it’s just me, but I thought the book actually read like it was written in the 19th century. Was that something you did on purpose? WM: It’s probably more of a traditional style. I just read a book about the Chinese in the Civil War, and it had splintered writing, pieces of sentences. But when you get into that time, people were simpler. Their world was limited. MT: Given the subject matter, and the fact that the title “Pukoko” translates as “blood red,” your book is actually very gentle. WM: He [Mo‘ikeha] is a gentle character. Part of that is the Hawaiian spirit–be gentle and nice, and he carries it through. But it’s reversed when he reaches the black man who cares for him. These guys really didn’t want to fight, but you get to a point where someone has to fight for what’s right. I never call him a mercenary, but he joins for the money. [Honolulu-born veteran James] Bush–that’s why he fought, to get a good pension. WM: Yeah, when he’s on the boat, the obvious thing is for there to be a big storm. But that’s so cliche. So I did a murder scene, with all the elements of old Hawaiian society there. MT: I have to admit that scene reminded me of a Gilligan’s Island episode, in which Gilligan and the Skipper find out there was a murder before they sailed, and all of their fellow castaways are suspects. WM: It is one of the lighter scenes in the book. The sugar man in it is [James] Campbell, basically. That’s another thing I learned–I had no idea that they grew potatoes in Lahaina before sugarcane. I write under the presumption that if I didn’t know something, then my audience likely didn’t know either. That’s the old teacher in me. MT: Clearly, you did a great deal of research, on both the war and life on Maui in the mid-19th century. Did that ever hinder you when developing the story? WM: Research can be a stimulus to me to stay on track. But with all my books, I do the research and then put it aside. I only go back to it if I need something really specific. I have a lot of names of hotels in the book, and they’re all real. But I will just take the general impression from my research and then write my story. I have all my notes. I happily came across a CD-Rom of daily life in Lahaina in the 19th century. That’s how I learned about the fire in town. MT: Which I had never heard of. WM: It was all more of a stimulus, not a hinderance. Though I was trying to keep the timeline correct, which I did until I came to the Shenandoah. Lots of people don’t know there were warships in the Pacific. MT: The Shenandoah was a Confederate ship that preyed on whaling ships during the war. Since many Hawaiians who worked on those whalers ended up getting captured and pressed into service on the Shenandoah, I can see why you wanted to put the ship in the story somehow. WM: For a while, it was really difficult to fit it in. She didn’t get into the Pacific until the war was really over. I put it aside for about two weeks, and then realized how I could plot it. MT: What do you hope readers come away with from this book? WM: The obvious one is having a better sense of history and Maui’s part in it. Some people think Maui is just a little island, not too important. But we played a part in this bigger picture. MT: You’ve done a number of book tour events so far. How are audiences receiving book? WM: They’re fascinated by it, but they’re in the same boat I was in when I started. Civil War buffs are crazy about it. There are so many Civil War books out there now, especially since this year is the 150th anniversary of the end of the war. MT: How’s the book tour going? WM: Good. I just got invited to the Honolulu Book and Music Festival on May 2. I’ll talk about the book, do a reading. I usually read the part where he meets the black man. I also usually read something from the beginning, where he goes to Olowalu to find a canoe. WM: And I left out some steps! Otherwise that would have been a book in itself. • Sunday, March 22: Barnes and Noble, Lahaina–2-3:30pm. Special Guests include Ata Damasco and Kalei Jaramillo and company. • Tuesday, April 14: Wailea Women’s Literary Society Golf Vistas, Vicki Hyde’s Residence in Makena–11am. • Saturday, May 2: Honolulu Book and Music Festival, Honolulu Hale Hawaiian Pavilion–4-5pm.